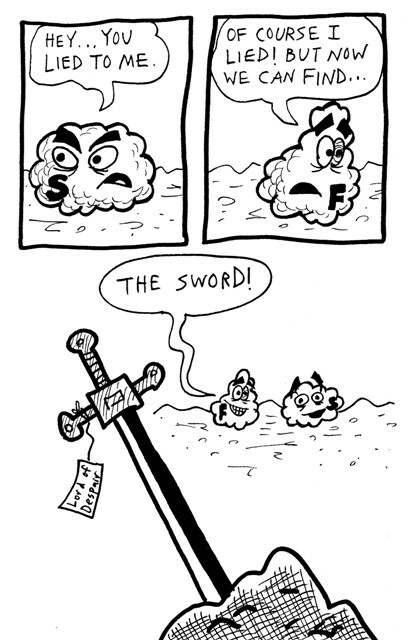 Fuzzball & Scuzzball - The Sword Revealed! Comic 20 - The Sword Revealed! We had hoped to introduce the Lord of Despair as a character at some point but by the time we reached page 20 of 24 we knew that wasn't going to happen. There just wasn't room. I had to start wrapping things up, so that's why they turn around and see the sword. There's not much comedy on this page, just the grinding sound of naked plot advancement. Look at those top two panels. Notice how Fuzzball is to the left of Fuzzball, yet the Scuzzball panel is to the left of the Fuzzball panel. So even though they are theoretically looking at each other, the panel placement makes it look as though they are looking in opposite directions. This was a terrible choice on my part, a violation of the rules of comics storytelling, and I apologize for it.